A couple days agoa I saw Diedra tweet that she was making Fireman's Chicken. I was instantly intrigued. A google search showed that it is also called Cornell Chicken. It was originally created by a Cornell food science professor, Dr. Robert C. Baker. He also invented the chicken nugget, turkey ham and poultry hot dogs. The chicken went on to become so popular that it was a must have at every cookout and barbeque in Western New York. Fundraisers, Fireman's BBQ's, festivals and the like. I love food that comes with a story... a background... some history. We used this recipe and yes... it is delicious! 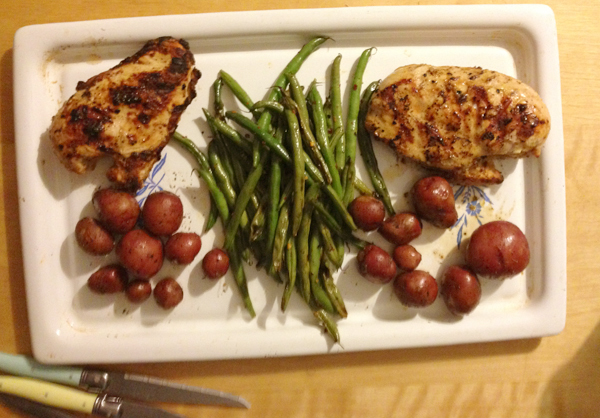 We didn't even wait to dish it up and ate it right off the tray we brought it in from the grill on. My husband and I come home to Rochester from Chicago every year to help them prep the chickens. We dunk them in Cornell Recipe marinade and then they're grilled on the world's largest portable chicken barbecue. Sandy - Really?! That is awesome!